Born in Queanbeyan City, New South Wales, Australia on 5th September 1939. After serving in the Australian Army, he turned to selling cars for a living, before becoming a top male model in London, where he had arrived in 1964. The search for a new actor to portray James Bond had begun in 1968, after Sean Connery had announced he was finished with the role. Lazenby won the role of Bond in On Her Majesty's Secret Service despite having no prior acting experience save for TV commercials, where he was very popular doing commercials for Big Fry Chocolates. Lazenby was competing against John Richardson, Anthony Rogers, Robert Campbell and Hans de Vries, but won the role based on a screen-test fight scene. There was apparently much conflict on the set of that film, with Lazenby having strained relationships with director Peter Hunt and Bond Girl and former Avengers star Diana Rigg, as well as the producers. Today he admits he took bad advice, when he announced that he would not be doing any more Bond films. Connery was lured back for the next one, and Lazenby's acting career floundered. 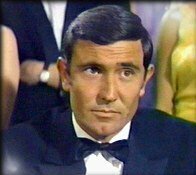 Ironically, Lazenby's Bond film is considered by many fans to be one of the best in the series. During the early 1970s, Lazenby worked in Hong Kong, and was going to make a film with Bruce Lee right before that actor's untimely death. A few years ago, after a long layoff during which he raced cars, he returned to acting. He often attends James Bond fan events. In 2002, he was married for the 2nd time to former tennis pro Pam Shriver.